Welcome to the website of the New Zealand Thyroid Support Group. 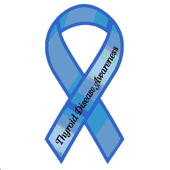 We are a source of support for individuals to meet, talk, and share information about thyroid disorders. The thyroid gland is a small, butterfly-shaped gland found in the throat. The thyroid gland produces thyroid hormone, the main regulator of the body's metabolism. When the thyroid gland doesn't function properly, it can affect all aspects of physical, mental and emotional well-being. Thyroid disorders can occur more often in women than in men (read more).